Steven Holl Architects has won a competition to revamp Ireland's largest university, with a proposal featuring buildings that reference the geological forms of the Giant's Causeway. 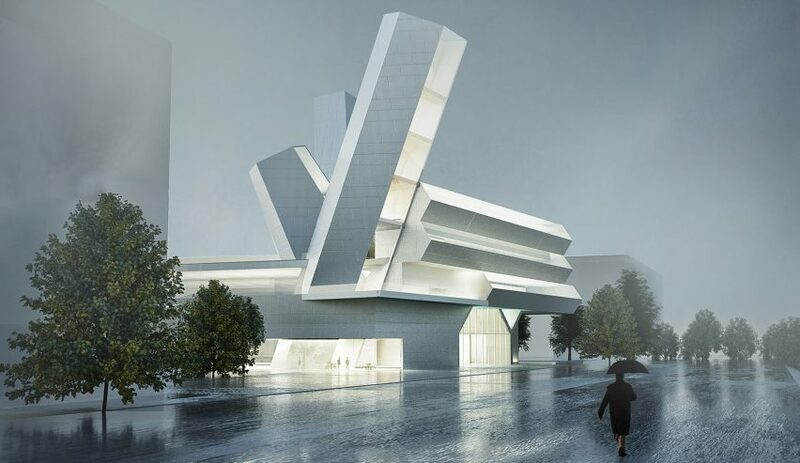 The New York-based firm, led by architect Steven Holl, was selected ahead of Diller Scofidio + Renfro, John Ronan Architects, O'Donnell + Tuomey, Studio Libeskind and UNStudio to design the new masterplan for the University College Dublin campus. The masterplan centres around the construction of a new facility, the Centre for Creative Design, intended to form a new gateway for the university. This building is designed to reference the unusual geometries of the Giant's Causeway, located approximately 160 miles north, which famously features more than 40,000 hexagonal basalt columns. The building will boast two prismatic towers, both angled at 23 degrees to mirror the earth's tilt. There will also be an auditorium that matches the shape of the dodecahedral water tower that has stood on the UCD campus since 1972. Other features include the addition of a new pedestrian throughway, which will run parallel with the existing campus spine to create an H-shaped layout. Around this, the firm plans to add seven new quadrangles of green space, a plaza and a reflective pool. There will also be new cafes, landscaped gardens with "water-retention ponds", preserved trees and sheltered seating areas. Holl described it as "a very important and inspiring project". "Our masterplan and the new UCD Centre for Creative Design are not just iconic objects − they reflect on the history and quality of UCD's campus, responding to the particulars of the site to create place and space," he said. The contest, organised by Malcolm Reading Consultants, was judged by a panel led by university president Andrew J Deeks, which included architects David Adjaye and Ann Beha, Royal College of Art vice-chancellor Paul Thompson and Ballymore chairman and CEO Sean Mulryan. "Holl's vision is intriguing and striking – combining an iconic design for the Centre for Creative Design with a masterplan distinguished by a few considered, highly intelligent moves that open up the centre of the campus and use creative landscaping to intensify its natural beauty," said Deeks. "The Centre for Creative Design promises to be an exhilarating presence, announcing UCD from afar, creating a new Dublin landmark, and giving visitors, students and faculty a definite sense of arrival." Steven Holl Architects has previously worked on numerous university buildings in the USA, including the Institute for Contemporary Art at Virginia Commonwealth University, the Visual Arts Building at the University of Iowa and the Campbell Sports Centre at Columbia University. The firm was also responsible for the new Glasgow School of Art building in Scotland. The University College Dublin project will be delivered in collaboration with Dublin studio Kavanagh Tuite Architects, landscape firm HarrisonStevens, engineering giant Arup, climate engineer Transsolar and analysts Brightspot Strategy.